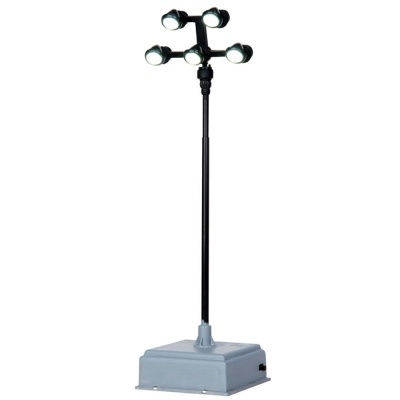 Lemax Field Lights Accessory provides a miniature village individual battery powered tall field light illuminated by five small bulbs, compliments your Lemax seasonal display. Scaled and themed for placement in and amongst a modern Lemax village scene, adds illumination and realism to a model rural setting. The field lights contain 5 LEDs that are powered by a self contained battery pack (AC mains adaptable) within the base, ensuring wires are not in sight from your display. 32cm tall self standing lighted accessory joined the Lemax Village collection in 2014.